AMMAN — The Department of Antiquities (DoA) has unearthed the remains of a Roman cemetery in Abdoun, it announced late on Monday. 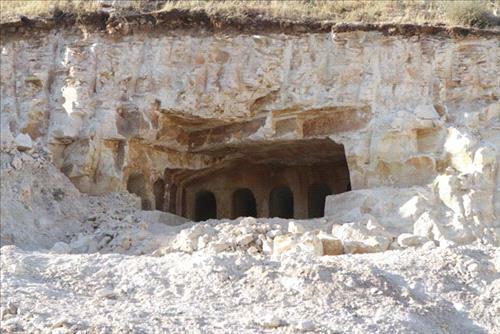 Ahmad Al Shami, Amman antiquities inspector, said 12 burial sites were discovered in addition to artefacts and human bones dating back to the Roman era. The site in Abdoun, which is one of Amman’s upscale neighbourhoods, includes numerous graves and skeletal remains of several individuals, according to Shami. In addition, archaeologists have found pottery and a coin. “We will study the pottery and the coin for more details about that era,” he told The Jordan Times over the phone on Tuesday. Shami added that they did not find a complete skeleton, only remains, which experts will study to identify the age and gender of those who were buried at the site. In addition to the 12 graves the DoA unearthed, there are two destroyed tombs and a small yard in front of them that was used to prepare the dead bodies, he noted. “We also found symbols of Rosetta, the Roman flower, engraved in the stones,” Shami said. The cemetery was discovered on private property by a contractor supervising a construction project, and the owner was requested to stop work at the site until studies by the DoA conclude.